According to a patent originally filed in Q3 2011 and published by the United States Patent & Trademark Office earlier this month (via PatentlyApple), Google invented a new search gesture for future Android devices that incorporates various forms of the letter “g”. 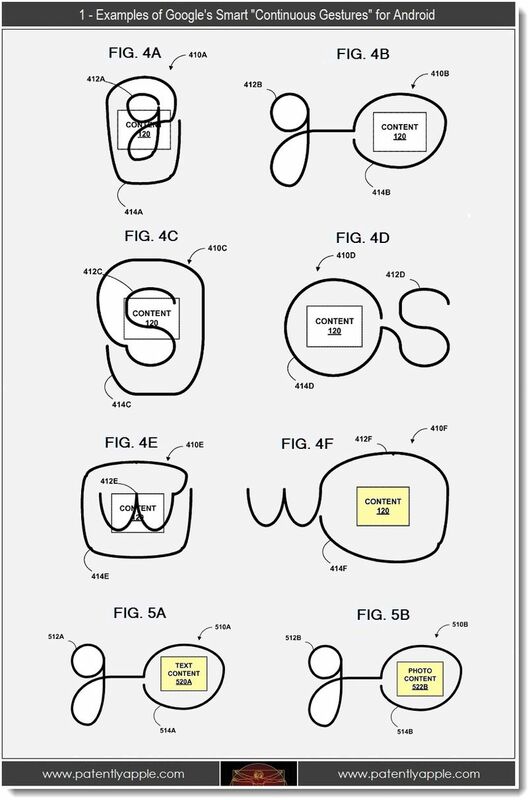 As described by PatentlyApple, the gesture would allow users to circle what they want to search for within the letter “g” or “g + o” (as shown in the graphic above), and perform the search when lifting their finger. Google would not limit the feature to just Google searches, however, it would also allow you to access alternatives by drawing an “S”. If you follow Google’s logic, then it could very translate into allowing users or companies to create their own letter combinations to signify a specific search engine related to their industry or profession. Meaning instead of drawing in “G + O” to use Google’s search engine, a lawyer could draw in the letter combination such as “L + O” and have that combination translate into a search in LexisNexis. That could open up some interesting possibilities going forward.